Dining in Crested Butte is ALWAYS great! Michael Carlton of The Denver Post once said "Crested Butte has more fine dining restaurants per capita than any other town in the U.S.". Whether you crave a burger, sushi, elk tenderloin, steaks, seafood, or just relaxing with a unique cocktail, Crested Butte Dining won't disappoint. Located just steps from the mountain slopes, 9380 Prime is the base area`s hot spot for slopeside dining and entertainment. 9380 Prime Restaurant and Bar is Crested Butte`s only ski-in/ski-out dining establishment, complete with a pet-friendly, outdoor patio and bar. Located at the ski area in Mt. Crested Butte, the Avalanche features breakfast, lunch and dinner daily with huge sandwiches, colossal salads, homemade soups, pizza, a great kids` menu, delectable desserts and all your favorite comfort foods. Don`t miss our nightly dinner specials. We celebrate happy hour from 3-7 daily with cheap drinks and marvelous munchies. Dine in or take out. Serving 7:30 a.m. - 9 p.m. daily. Serving up casual lunch and dinner classics, along with delicious libations (including full strength milkshakes for 21+), live music and the best deck in the base area to soak in those Colorado bluebird days. We`ll bring you a drink while you lounge slopeside and watch family and friends cruise down Warming House Hill, or watch the kiddos bounce on the bungee trampoline on the deck. Location: Mt. Crested Butte, Slopeside. Named after the local Floresta Coal Breaker - the largest coal breaking facility west of Pennsylvania in the late 1800`s - Coal Breaker Coffee offers one-stop convenience for a morning warm up. Be sure to check out the photographs and pieces of mining history that create a unique, historical ambiance from which the outlet get its name. Located at the base area of Mt. Crested Butte, is a quick service, no frills burger shop serving 100% Angus beef patties, never frozen, on hot buttered buns with hand cut french fries. Talk about dining with a view! Spend your day doing laps on the Paradise Express Lift, then take a break at Paradise Warming House for libations (including the famous Bacon Bloody Mary! ), and delicious cafeteria style food. Paradise also features the ONLY salad bar on the mountain! Pair that with a burger, soup, pasta or baked potato and you`ve got lunch made. Iron Horse`s menu focuses on American comfort classics using only the finest ingredients available. The includes pizza, burger, BBQ and much more. Vegan and Gluten free options A kid friendly menu and dining room makes this a family favorite but don`t be mistaken, our bar is stocked with fine liquors and Colorado brews on tap. Lodge at Mountaineer Square, Mt. Crested Butte. Trackers is Mt. Crested Butte`s most comfortable year-round bar and lounge inside the luxurious Lodge at Mountaineer Square. Serving high-end whiskeys, bottled beer, fine wines and a tasty bar menu during the spring, summer and fall months and a heartier menu during the winter season. 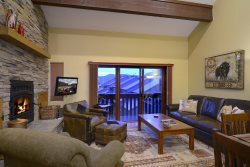 Live music, fireside seating in cozy furniture, two large plasma TV`s and outdoor patio seating makes this the perfect place for a peaceful drink or appetizer on the mountain. Open daily at 4 p.m. Private meeting, wedding and banquet facilities available. Lunch at Uley`s Cabin and Ice Bar is for those skiers and riders who want both fine dining and a casual experience for their afternoon pause before heading back out on the slopes. Come visit our famous Ice Bar, which is exactly as it sounds, and toss a couple cocktails back while enjoying the incredible view and casual, yet delicious food Uley`s is known for. Located next to the Adventure Park. Golden delicious hand-snack Belgian sugar waffles. Bonez features an exciting collection of Mexican entrees, street tacos, and Crested Butte`s largest tequila selection. Have a fresh squeezed margarita at one of Crested Butte`s oldest historic bars, grab a seat at the 20 foot community table and enjoy house made chips, fresh salsa, queso blanco or their famous D.I.Y. guacamole. Indulge in fresh brick oven-baked pizza, deep dish or thin crust. Wings, Subs and the largest salad bar in town. 24 beers on tap and a brand new full bar. Large patio seating and outdoor bar in the summer and fall. "Best Coffee in Colorado: - Denver Post. We have what it takes to meet the most demanding coffee expectations. Stop by our garden located in Crested Butte at 4th and Elk in the historic License Plate coal shed. Django`s restaurant & wine bar on Elk Avenue. Enjoy globally-inspired small plates are perfect for sharing and pairing with wines by the flight, quartino or bottle. The Cantina serves flavorful homemade Mexican food at affordable prices in a friendly, fun atmosphere. Kids are always welcome. Tasty entrees include fajitas, enchiladas, chimichangas and our gourmet nightly dinner specials. We serve many varieties of fresh lime juice top-shelf MARGARITAS. Elk Ave. Prime Steak house is located in the heart of downtown Crested Butte on Elk Avenue. We feature hand cut highest quality USDA PRIME steaks, pastas, lamb chops, elk, pork chops, fresh garden salads and more. We also have a great kids menu. We have a vast array of import and domestic beers as well as the largest wine selection in the valley. You can enjoy any of our drinks from our outdoor patio or cozy up next to our fireplace, great after a long day of skiing. Elk Ave. Prime is one of the largest venues in Crested Butte, ideal for large parties. First Ascent Coffee Roasters and The Guild Cafe have teamed up to offer the best in drinks, bakery items, and lunch. Sip our famous Mango Mojito or house infused Ginger Martini at the BEST HAPPY HOUR in town. Using only the freshest local, organic produce and natural meats. We specialize in Tai, Indian, and Vietnamese cuisines, with a little home cooked fusion for good measure. Serving the best sushi in town as well as meat, seafood, and options for the kids. We serve our guests the highest quality of fish which is why get it delivered 6 days a week! We offer a nightly happy hour from 5:30 to 6:30. Open 7 nights a week at 5:30. Reservations recommended but not necessary. Crested Butte`s premier Italian restaurant. Michael Marchitelli strives to create an atmosphere that feels like home, with recipes handed down from his grandmother. Serving fantastic breakfasts and excellent lunches with a creative twist. Open early and serving a full breakfast all day! Offering pizza, pizza rolls, pasta, deli sandwiches and salads, as well as a variety of tasty treats to satisfy a sweet tooth. Breakfast burritos and egg sandwiches available anytime of the day. A Crested Butte tradition for more than 25 years with a casual atmosphere and excellent food. Specializing in your favorite breakfast burritos, skillets, pancakes, fresh fruit and traditional breakfast. Plus cheese steaks, salads, soups, deli sandwiches, seafood, burgers and vegetarian fare for lunch. Gyros, kabobs, sliders, fresh made hummus and baba gannoush, pita nachos and homemade soups. Greek and tahini salads, spanokopita and curly fries. Outdoor dining. Happy hour specials. Serving everyday. Rumors Coffee and Tea House is a full service espresso bar in downtown Crested Butte that offers a wide selection of coffee, loose leaf teas and other specialty beverages. We are located adjacent to Townie Books, a wonderful little indie bookstore for your browsing pleasure. Bringing you the best culinary treats from Thailand, China, Japan, and Vietnam. Spacious outside dining room and an atmosphere that is perfectly casual. Sherpa Cafe in Crested Butte, CO offers the unique flavors of Nepali and Indian foods with prices that are very reasonable. We serve the best authentic Nepali and Indian foods. A truly unique dining experience. Skillet fried chicken and steak dinners served family style. The toughest part is deciding what tastes the best: the mashed potatoes, fresh biscuits, corn, chicken or steak. Full drink menu and wine list. Soupcon is a romantic petite bistro located just off Elk Avenue on Second Street behind Kochevar`s Bar. Featuring traditional techniques using local ingredients married with the finest cuisine from around the world. Two seatings per night, reservatins required. Tasty margaritas, handmade tamales, a great selection of burritos and tacos, affordable prices and lightning-fast service-what more could you ask for? Fresh lime margaritas and a wide array of mexican beers. Dine in, take out. A true Crested Butte Original. The Steep`s specialties include freshly made salads, sandwiches, fine desserts and the coldest beer in town. VOTED BEST PIZZA since 2002. "The Stash should not be missed" - Powder Magazine. "The hip joint on Elk Avenue" - Skiing Magazine. Set in a historic 100-year old miner`s cabin, Crested Butte Iron Chef and dough master Jeff Graceffa serves hand tossed gourmet pizzas, award winning grilled Asian style BBQ chicken wings, fresh salads, and more. A full service bar and limitless beverage possibilities also await you. The Nickel, Crested Butte`s oldest saloon and great steak house, has been hosting visitors and locals alike under the current ownership since 1981. Features a wide variety of U.S.D.A. Prime graded steaks, seafood, lamb, pork, lobster, crab, salads, sandwiches, as well as our famous prime rib. Donuts are made hot and fresh while you wait. Watch the machine make up to 2000 mini-donuts per hour! The mini-donuts are served warm covered with glaze, cinnamon & sugar, powdered sugar, ice cream or with a hipster topping. Desserts extraordinaire: fine chocolates, homemade fudge, sugar free chocolates, ice cream, fresh baked cookies, illy brand cappuccino, espresso, kids` candy, Pepsi products, bottled water, gourmet jelly beans and lots of other candies. Truly homemade ice cream, made from scratch, in small batches, here in Crested Butte. They offer a mix of traditional and inovative flavors, as well as non-dairy ice creams and sorbets. The Dogwood Cocktail Cabin is nestled into one of Crested Buttes funkiest historic remodels. This miners shack turn "cocktail cabin" offers house infused artisan cocktails & tasty plates both sweet & savory. The Eldo Brew Pub and Tap Room offers homemade and other brews, live music and Crested Butte;s favorite pub food menu. As a legendary landmark, "The Sunny Place for Shady People" this is the "go-to" stop for locals, tourists and live music acts. Crested Butte`s oldest active saloon and favorite place to play. Built by the Kochevar`s out of hand-hewn logs in 1896. Original furnishings enhance contemporary games of cards, pool, shuffleboard and darts. Montanya Distillers is open daily all year round to the public for free rum tastings, distillery tours, artisan cocktails, appetizers and small plates, bottles of rum, gifts and merchandise. Live music throughout the year and patio seating in the summer and fall. The Princess Wine Bar is a fine drinking establishment located in historic Crested Butte. Features live music by local musicians daily. If you are looking for a good time, the Talk offers foosball, pinball, video games, good music, and pool tables any night of the week.